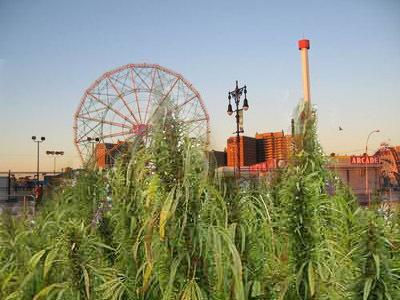 Cultivated plots have also been found—and destroyed—in such unexpected districts as Coney Island and the so-called “jungle” near Brooklyn bridge. Some research revealed that in 1934 the cops busted what is described as "a large field of marijuana growing near the Brooklyn Bridge." A Coney Island crop was found on West Third Street in July, 1936. Pot fields in Dumbo and Coney Island. Who knew? Maybe that is why Thor Equities is up to buying up all that land--they're going to turn them into weed-filled vacant lots.